Most Bluetooth accessories don’t have battery indicators located on the device itself, and that includes the Apple Wireless Keyboard, Magic Mouse, and Magic Trackpad. 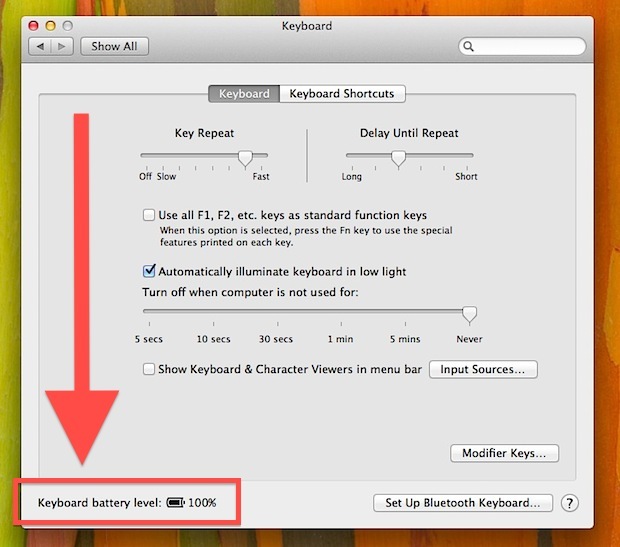 Rather than waiting for the battery to run low, thereby causing the devices connection to weaken, stop registering movements, clicks, or certain behavior, you can choose to manually intervene by periodically checking the battery level of most Bluetooth devices connected to a Mac. This is done easily by looking in either the Mac OS X Bluetooth management menu and Preference panel, we’ll show you how to do both. This is by far the easiest method to quickly check on any connected devices battery level, though you will obviously need to have the Bluetooth menu enabled to be able to use this*. * If you don’t have the Bluetooth menu visible, you need to enable it through checking the box at  > System Preferences > Bluetooth > “Show Bluetooth status in the menu bar”. All connected Bluetooth accessories will show a Battery Level here as a percentage, though it won’t provide a time estimate of what’s remaining like the standard battery indicator for portable Macs would. Regardless, this is the absolute easiest and fastest way to check on a wireless bluetooth devices battery life. If you don’t want to use the Bluetooth menu bar management item for whatever reason, you can also rely on the System Preference panel though. And then if you wanted to find another devices, like a trackpad, you’d need to visit the Trackpad system preference panel. If you use multiple Bluetooth devices this isn’t preferable, and you’ll be better off enabling the Bluetooth menu bar item and using that to check things instead. Most Bluetooth devices are very power efficient and don’t have many demands, though things like headsets will drain faster than a keyboard. Regardless, it’s a good idea to have a set of good rechargeable batteries handy that work with whatever accessories you use frequently, because it’s never fun to have a device run out on you, and very low battery life can also be a reason why Bluetooth connection strength suffers. If you’re trying to figure out if that is an issue, check the battery life and monitor the signal to see if it improves with new batteries in place, oftentimes it will. Thanks to Tim for the question and tip idea. Contrary to your writing not all connected accessories will show a Battery Level. My Logitech mouse doesn’t, my Apple keyboard does. Or is that because I’m on Snow Leopard? Anyone know how do you check this battery life in iOS? Is it even possible? This may certainly be true for Apple Bluetooth devices…I use a Microsoft Bluetooth mouse and it most certainly does NOT display the battery charge (I wish it did). I’m just saying…maybe you should qualify your statements before you write them. I’ve got bluetooth headphones, mice, and two different numeric keypads. None are Apple branded. None show a battery level. This article needs to be amended. Ditto. I have several bluetooth headphones and none show a battery level even though they do when connected to my iPhone. So this utility works only for Apple branded bluetooth items. Thanks “noibs” for the confirmation. So what if it doesnt show a battery percentage? 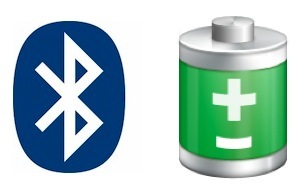 on system preferences under bluetooth The keyboard shows a logo but its a hollowed out battery. As I have it wired to a power source I took it out to see if the percentage would show up but nada. « The iPad Potty! The Worst iPad Accessory Ever Made? Or the Best?